He has been singing and performing as a solo act for 10 years and has also worked in many different bands. In 2002 Martyn moved to Scotland from Southern England, where he had a very successful business. He is now playing venues, private functions, parties, weddings etc throughout the UK and continues to teach in Glasgow. In 1996, he was a finalist in the prestigious National Guitarist of the Year competition (Guitarist magazine), and in 1998, he was also a finalist in the Acoustic Guitarist of the Year, performing original instrumental guitar pieces at both. He remains the only guitarist to have reached both finals. In his solo work, Martyn can play purely acoustic sets, or a mixture of electric and acoustic songs using high quality backing tracks, which give a ‘full band’ sound. He sings a very wide range of popular songs from 50’s to present day, adding new songs regularly to his repertoire. 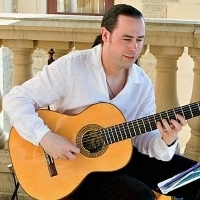 Martyn also plays classical and flamenco guitar styles, which are very popular at weddings and corporate functions.